If you want to squeeze a tremolo onto an already packed 'board, this is the one to opt for. Superb build. Great value. Respectable tremolo tones. Color knob a little redundant. The Fender Twin's optical tremolo circuit is one of the most sought-after tremolo sounds of all time, and Hotone's Trem is inspired by this classic effect. 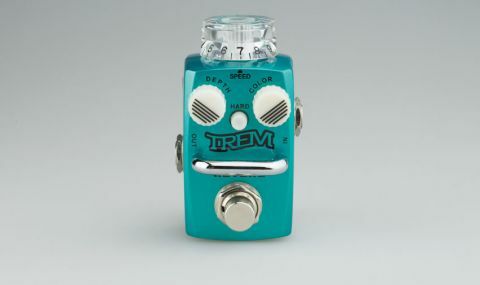 "Unlike a lot of similar effects, there's no volume drop with the Trem"
The default soft tremolo gives you slow waves to Spaghetti Western shimmer via the speed control, while the hard button engages a sharper chop for on-off helicopter slicing. Unlike a lot of similar effects, there's no volume drop with the Trem, although its EQ-tweaking colour knob isn't all that useful. Build-wise, the pedal's spec is way beyond what you'd usually expect from a stompbox of this size. There's a hefty zinc alloy enclosure, a rod to protect the knobs from your size 10s, while the switching is true bypass. What's more, the big upper knob includes two super-bright LEDs, plus the two smaller white knobs are noctilucent - in other words, they glow in the dark for easy onstage knob-turning.